The Swedish clothing retailer H&M reached 100,000 followers on Twitter this week, which is a first for a Swedish company. But that is just for its main account @hm. In fact, H&M is followed by twice as many, if you combine the number of users that follow the company’s 28 Twitter accounts: in total 201,000. It is very interesting to study H&M’s strategy, to complement a global account with accounts for local markets and that they are branded in a similar fashion (@hm plus country). The company today has one global account with 101,000 followers (@hm), one old general news account that is not used any longer (@HM_News) and 26 geographic accounts (25 countries and one province – Quebec in Canada). To see a full list of accounts, see this list of H&M on Twitter. 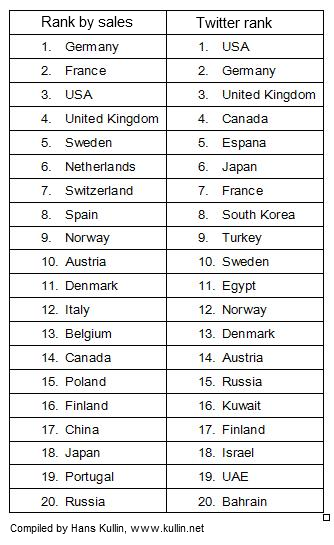 If we compare the countries were H&M has stores and rank them by sales (for stats, see this pdf) we see that Germany, France, USA and the UK are the company’s biggest markets (left column below). But the company has most followers in USA, Germany, UK and Canada (right column below). Switzerland is another top market but H&M does not have a specific Swiss Twitter account yet (Update: there is a Swiss account at @hmsuisse, but it is not yet active). South Korea is one of H&M’s smallest markets, but that local account has already attracted 2,600 followers. With this strategy H&M is able to reach more than 200,000 people on Twitter, many of them in their local language. All country accounts are in local language except the accounts from the Middle East and Turkey. Update: @hmturkyie is in fact in Turkish. I enjoyed your post and the analysis you put into it. I am very much in favor of companies and organizations compartmentalizing with numerous Twitter accounts instead of just one general account. In H&M’s case, they decided to do so because of cultural and geographical differences. However, there are other reasons to follow this strategy. The example that I appreciate the most is The Atlantic’s Twitter strategy. They do have @TheAtlantic, but they also operate a separate account for each section of their publication. For a magazine that has such a wide range of article topics, this makes sense in that it gives more freedom of choice to followers and helps define the voice and purpose of each account. H&M got local language also twitter account in Turkey. @yasin @emanuel Thanks, the post has been updated with your input.